Rhetorical question: How can something so simple be so elementally good? 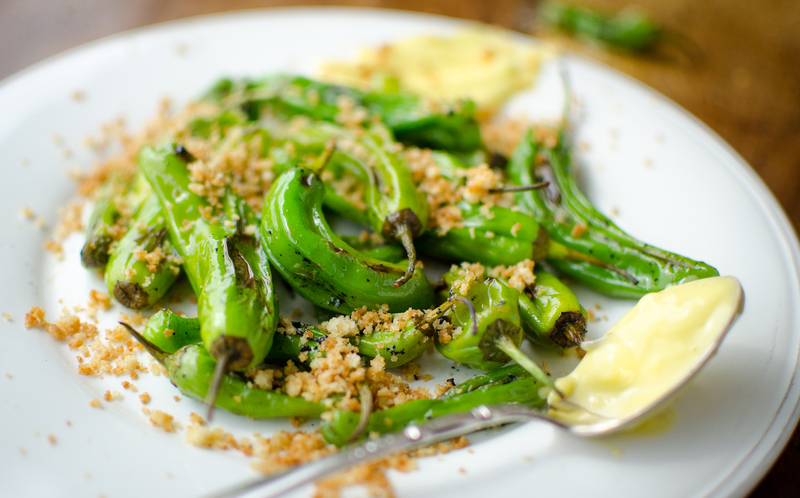 This simple dish of blistered peppers is an homage to a deliciously unexpected and uniquely memorable lunch at Nina June in Rockport, Maine one recent summer afternoon. Chef Sara Jenkins offers an amazing Sunday lunch in the time-honored Italian tradition of a long, leisurely mid-day meal with lots of wine, simple rustic food, and conversation. And deliciously leisurely it is. Consider a small, sunny table on the terrace overlooking the gently rocking boats in the harbor, a very cold bottle of Italian white and a parade of… pickled herring piled atop a tall hunk of grilled, house-made rye with parsley, onion salad, a crisp watermelon salad with spicy marinated feta, mint, lime and Aleppo..and my favorite – blistered shishito peppers with a garlicky aioli and fried breadcrumbs. Super simple. They were so good I immediately texted a photo of the plate to my daughter asking her if she happened to be growing these peppers in her garden. She was! (smart girl). So here’s my version – shamelessly copied, but every bit as good as I remember. 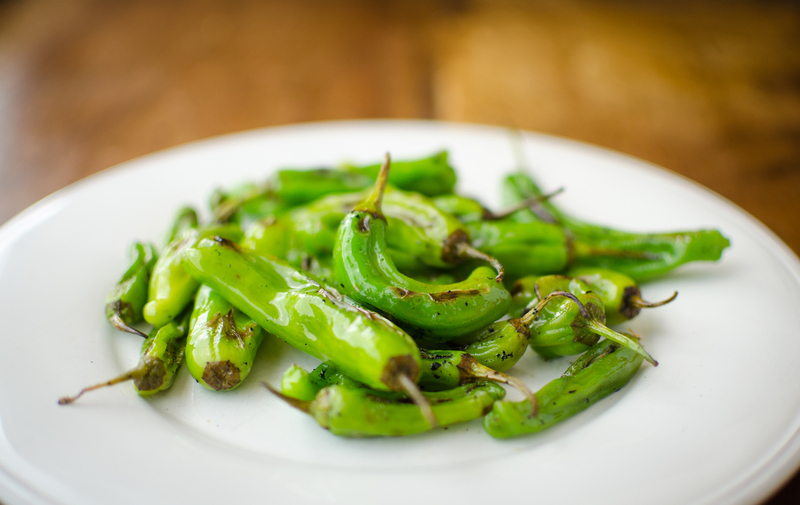 Shishito peppers, similar to Padron peppers, are mildly spicy, and… addictive. The spice builds as you eat them, lending a lovely numbness that just encourages eating more of them. Every once in a while you’ll get a pepper that is spicy enough to blow your head off (hence their nickname “Russian roulette peppers) but that just adds to their appeal. Blister these little guys in a cast iron pan on your grill or stove top on high heat, but don’t cook them too much as you want them to bite back a little. 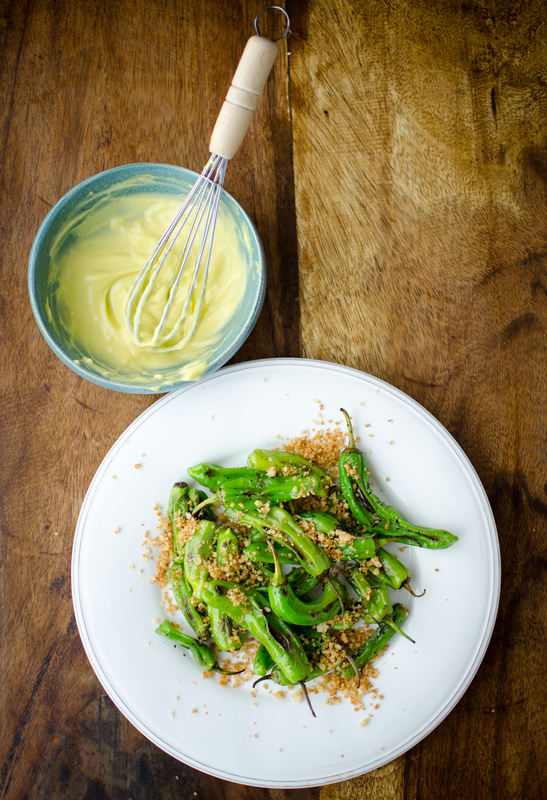 A garlicky aioli with a touch of Dijon is a great foil for the peppers and the fried breadcrumbs add a little crunch. In a small frying pan over medium-high, heat 1 tablespoon olive oil. Add the breadcrumbs, salt and pepper and brown. Tossing or stirring regularly so the crumbs don't burn. When the breadcrumbs are deep golden brown, pour them onto a plate to stop the browning. 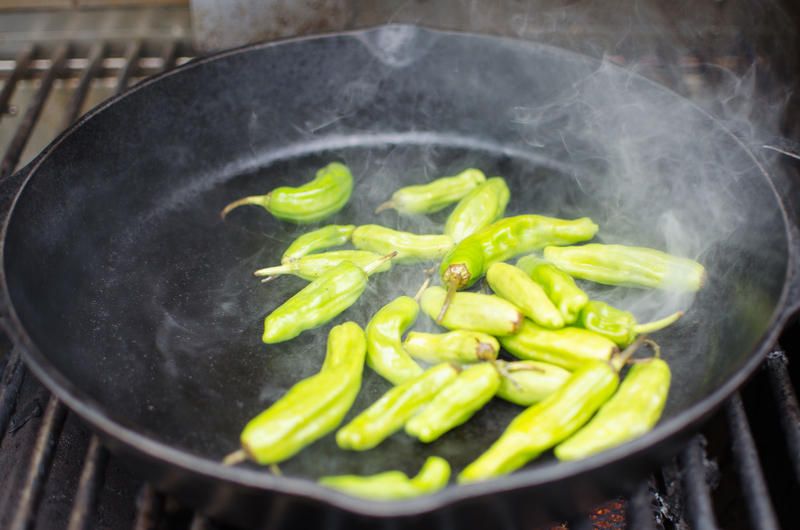 Preheat a cast iron pan on a grill or stovetop over high heat. 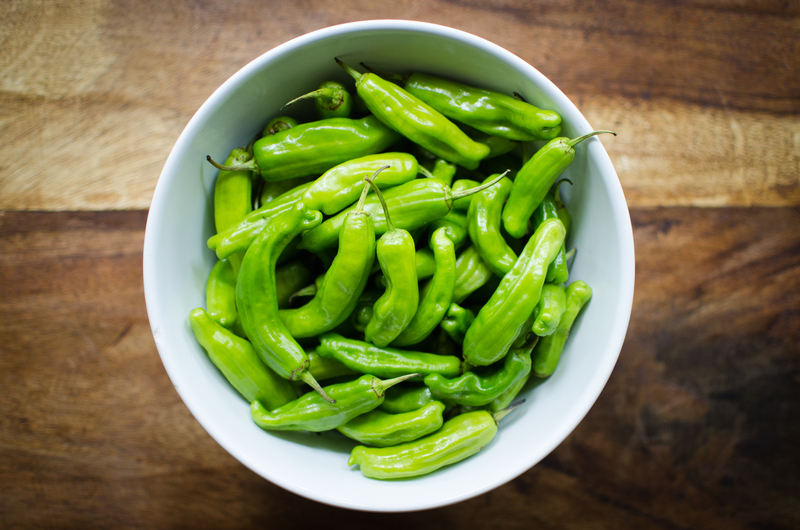 Toss the shishito peppers in remaining tablespoon of olive oil. Add the peppers to the pan and blister, moving them around with a spatula until they are blistered and charred but still a bit firm (about 10 minutes) Remove to a plate, season with coarse salt and sprinkle fried breadcrumbs on top. 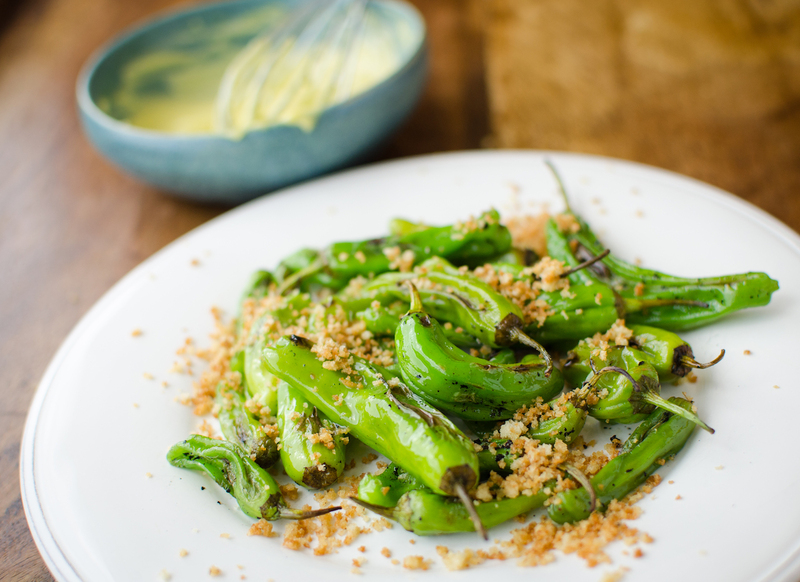 Serve with garlicky aioli.